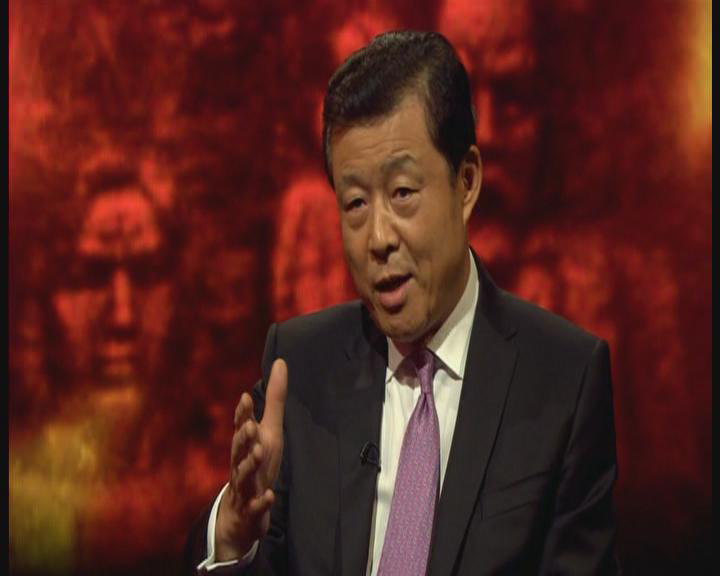 Peston:　Joining me now is the Chinese Ambassador to the UK, Liu Xiaoming. Ambassador, I think of China as this fast modernizing country, enriching country. But we've seen this extraordinary military display today, which takes some of us back to the era of Mao. Is this China again sending a sort of message to the world that, you know, you are fierce and dangerous? 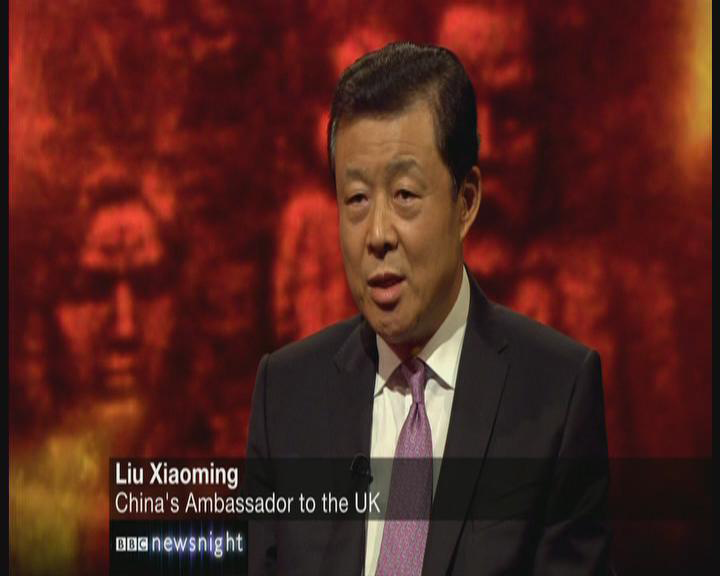 Ambassador Liu: I think the impression you had is not correct. In fact, the message is loud and clear, that is peace. Peace was hard won and peace should be cherished and maintained. And China will make its due contribution to maintaining world peace and regional stability. You know, in his ten minutes of speech, President Xi Jinping used the word "peace" for 18 times. So, that's the message. Peston:　So these gunboats that sailed off the coast of Alaska when President Obama was there today, was that just a sort of accident? Peston:　But this peace require defend spending to go up this extraordinary way, 12% last year, 10% this year? Enormous money you're spending. Peston:　I think it's the share of the GDP that's actually gone up a bit, given the rapid growth of the economy. But you talk about obviously your desire of stability. What do you think when you hear the leading Republican Presidential Candidate Donald Tramp talking about how he thinks that Chinese want Americans to starve? Peston:　But if he became president, how serious would that be? Peston:　Now is this display of military strength a distraction from the slowdown in the Chinese economy which many economists think is quite serious? Peston:　Five trillion dollars lost of the Chinese stock market. Is that trivial? Peston:　And very briefly, your president has said he wants modernized economy and see markets liberalized. A really important part of free markets is that people should be free to say whatever they like about those markets. Now journalists, hedge firm manager have been arrested for allegedly scaremongering about the stock market. To us in the west, that is very shocking. Peston:　But I said much scarier thing about British markets than they said about Chinese market. Do you think the British Government should arrest me? 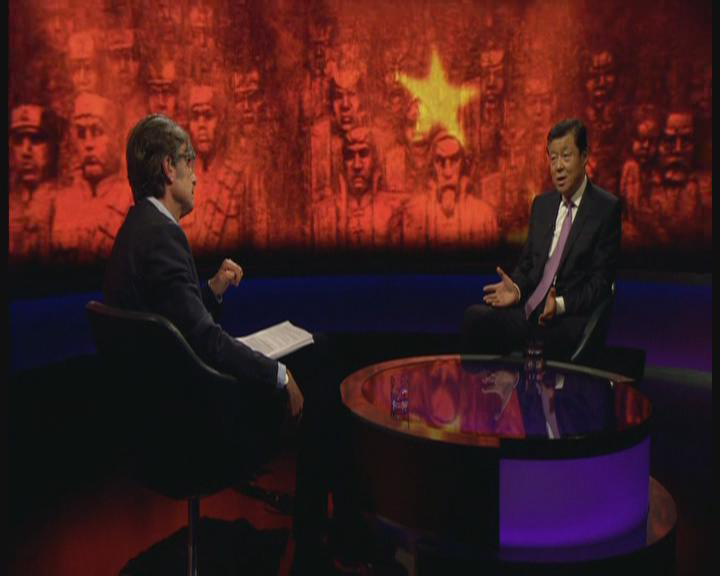 Newsnight is a popular BBC 2 current affairs programme which specialises in indepth analysis and robust cross-examination of senior politicians. Robert Peston has been the Economics Editor for BBC since 2013.